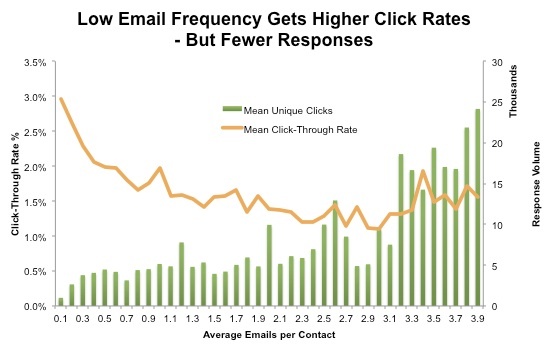 Email Frequency – When Is More Better Than Less? Blog Email Deliverability Deliverability Email Frequency – When Is More Better Than Less? A recent eConsultancy email marketing census showed that 55% of respondents attributed more than 10% of their total sales to the email marketing channel. Given the importance of email in procuring revenue, recent debate has risen over the frequency of email sending. Eloqua answers the question of how much is too much with hard data and analysis. Here’s how resending an email to people who didn’t open it the first time worked for one company. Before the email was resent, several changes were made to the email. Looking at the conversion rate, if this had been a promotional email there would have been a 33% lift in revenue just from resending an email. Remailing: How Often Should You Send? Take a look at some of the biggest influences on email marketing. While sending frequency is an important topic, what comes first is knowing the basics of email marketing – which is why we’ve put together an Email Best Practices 101 eBook for your viewing leisure. Read it today!